Omar Sultan: "I hope that Afghanistan will someday be a tourist centre again"
Cardboard is to Namibian artists what stone is to Zimbabwean sculpture. In order to make a cardboard box print, one has to cut out a piece of cardboard form a box. Then a knife is used to make etches, marks of shapes. Then ink is used to fill in the etchings made. The art form was spearheaded by Namibian artist/musician Ndasuunje Shikongeni (lovingly called 'Papa') who has teamed up with Zimbabwean artist and lecturer Chikonzero Chakuzunga. 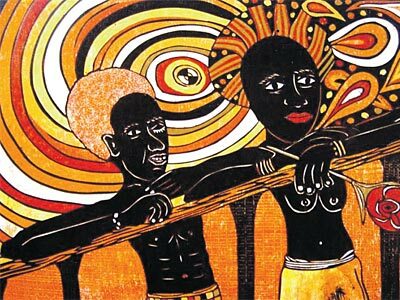 According to Papa Shikongeni, the art form which is still being practised in the two southern African countries was inspired by the Namibian John Muafangejo. The legendary artists who died in 1987 initially made linocuts. The cost of linoleum rose dramatically after the independence. That's why he switched to cardboard boxes, widely available in Namibia. Today, a generation of young artists have been trained in the art of cardboard printing. A number of workshops have been held in order to spread the gospel of the new art form. "I have trained among others Alfons Mvula, Petrus Amuthenu, Kaleb Haipinge, Ziggy Martin and David Amukoto", says Papa Shikongeni. Next to Shikongeni the Namibian cardboard box printer Joe Mandisia is active, who is also general manager of Namibia's National Art Gallery. Shikongeni says he focuses on village life in his prints "because that is where the wealth of the African people is. Our wealth is in our cattle and our plantations. Beautiful cars and big cell phones are not the wealth of an African child." June 2009 Papa Shikongeni has an exhibition in the WUK-Projektraum in Vienna.